Robert Leeds turned thirteen, of Bar Mitzvah age, in 2012, on Super Bowl Sunday February 26 2012. Robert comes from a privileged home. However, not all privileged home lifestyles teach you to rise above the ranks. In Robert’s case, in his home, such ethics are of prime priority. So when Robert counted the generous gifts he received on this significant birthday date, in Judaism it signifies entering the age of responsibility and accountability, he decided that the money can best serve the Jewish homeland, Israel. He donated the gift money portion that he received to Magen David Adom (MDA), its name means, the Red Shield of David, Israel’s comparable Red Cross. With that money, Friends of MDA (FMDA) purchased an ambulance to add to their ambulance fleet that is forever busy saving lives in a country of endless wars and terrorism. 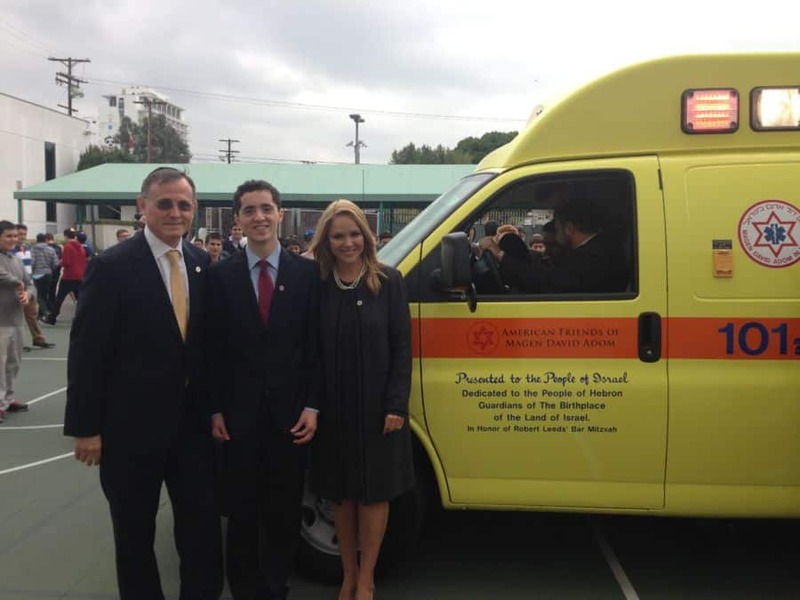 Once the ambulance, made in the USA, was ready to be shipped, Robert shared his gift for Israel with his school peers. The vehicle was displayed in the school yard and Robert shared his mind in a speech he delivered, which is worthwhile noting. First, I would like to thank you for coming together today to do a very special thing. 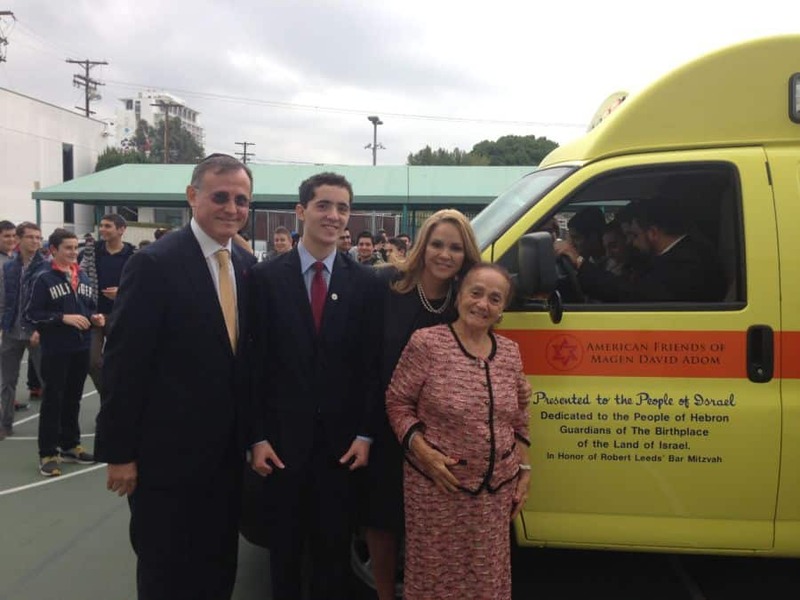 Today our community comes together to dedicate an ambulance to Israel. Designating an ambulance to any city in Israel would be great, because Magen David Adom and its volunteer paramedics and professional staff save lives and deliver new lives all over Israel. But if you read the dedication on the door of this ambulance you would see that this particular ambulance is going to the town of Hebron. Well … Why this school? Why a Yeshiva? Why anything Jewish? My choice for all of the above comes from the same source and for the same reason. You see, our Jewish heritage is important to me. Our history, our Torah, our people and the origin of who we are and “why” we are – is likewise very important to me. You know some time ago, when looking for a homeland for our Jewish people – a number of options were given to us by other nations. Uganda was a possible place that was proposed as our Jewish Homeland. But we are not to dwell in just any place. We belong in Etetz Yisroel! Well that’s the key. And that is why Hebron is very important to me and to all of us as the Jewish people. You see HaShem gave us Eretz Yisroel. The Torah begins in Bereshit (Genesis), describing creation, because it is important to know that God created the world. And in that God is the ONLY One Who allocates Land and He allocated it to Us – The Jewish people. G-d chose Eretz Yisroel. That is our promised land, and this is where G-d- (through Moshe Rabenu-Moses) eventually led us back to. There have been many times that we have been led back to our homeland. We have been destroyed over and over again, but still we come back from the four corners of this earth – as wandering Jews – back to our homeland. But to Israel! Not Uganda, not Europe not anywhere. But To the land of Israel! Why do we come to Israel and not to Uganda and what is our tie to the land? Well, we said God gave it to us. And with that we have lived in the land from the first day of our patriarchs and we have been likewise buried in our land since. Look beneath the soil and see only remnants of our history and heritage stemming back to our patriarch Avraham Avinu. The moment he found G-d and became the first to follow Him, what did he do? He purchased a burial place for himself and the rest of our forefathers. Avraham purchased his land in Hebron even though he was offered this land as a gift from the seller. Avraham insisted on paying for this land; and this transaction, what I call in real estate terms the first recorded escrow in our history took place. Avraham insisted on paying lest he be questioned one day about its ownership. He did not want a gift that could one day have its ownership questioned. No, he made sure to pay for the land. And the Torah goes on to say that Abraham, Itzchac (Isaac) Yakov (Jacob) Sarah and Leah were going to be buried there. And if you go to Hebron today, you will see that every word of the Torah is True. There lies our Avotenu (our Forefathers) and there lies our Emanu (our foremothers). As true as the Torah said to us about the origin of our people and our tie to our land. You see, if we ever forget the importance of Hebron, as the origin of our History and our people, or if we forget our G-D given right to our land – than being in the Land of Israel would be no different than settling in Uganda or any other place. Our land without our history is just land. Any land. That’s why I chose to dedicate the ambulance to the heroes that live in Hebron. You see they are the “guardians of our homeland” and the guardians of our history and heritage; they are the Shomrim-the guards, protecting the reason why we are in Israel. They are the Jews who understand that without Hebron, than we have no right to our land. Only because our history IS in our homeland, and because OUR forefathers and foremothers are buried there, that makes OUR history and OUR continued presence in our home land important. My friends, please join me in fortifying the people of Hebron and showing them that we love them, that we respect them, we are with them – and we appreciate their heroism and dedication to our people. And this is why God has Blessed us to return to Our Land. Hebron is the genesis. Chevron is the reason. Chevron is the purpose. May we merit always to be in our homeland and to honor the history that makes it ours. Thank you for joining me in supporting the people of Hebron and thanks to Magen David Adom that provides life-saving services to them. When a young man such Robert takes on responsibilities at such a young age, the future of the Jewish people is promisingly bright.